Venus is the hottest world in the solar system. Its surface is mostly covered with plains of solidified lava that welled up from the deep. Lava covered nearly the entire planet; the only areas that avoided it where higher than the level of the lava flood. These uplifted areas are now the oldest exposed areas (their name is: tesserae), which are slashed by intersecting rifts. At the beginning, there was probably water on Venus, but when greenhouse heating intensified, then any water vanished without a trace, due to the high temperature of the atmosphere. If there were ancient seas, any traces of them are today under many kilometres of solid lava. The sun never shines on the surface of Venus, because the Sun is obscured by thick cloud layers covering the entire planet. The sulphuric acid rain evaporates before even reaching the surface. Above the clouds, life may be possible, but not in the great heat present below the clouds. When was there water on Venus? It is not known what Venus was like in the first 3.5 billion years of its history. Perhaps there were seas in this early time, but no record of this time is preserved on the surface. Will there ever be a cooling down on the surface of Venus? It does not seem so. It is expected to become even hotter with continued trapping of heat from the sun. Is there water on Venus? Not even a drop. All the water evaporated in the burning heat. Why is Venus so hot? Because of the atmospheric greenhouse effect and because it is closer to the Sun than is the Earth. Why Venus is covered by lava everywhere? Most of the Earth – including the bottom of the oceans – is also covered with lava. Lava plains of Venus may have been produced from lava flowing from millions of small volcanic centres. Why are there ancient creatures and trees on the map of Venus? It reminds us that before the space probes were sent there, many thought there were dinosaurs and ancient swampy forests on Venus. Later this belief was found to be very wrong. Who are the girls on the map? Venus is a bright white star as we see it in the sky, so all nations named the planet after their own beauty goddess. These goddesses are shown on the map. Scientists go on with this tradition and almost every surface formation is named after women – fictitious or real. What tasks were performed by the Soviet Venera probes that landed on Venus? They obtained the only photos taken from the surface itself, and they determined the composition and other characteristics of the atmosphere and surface. Is a manned expedition planned to Venus? No. It’s too hot there and air pressure is too high. Have wheeled explorer vehicles been sent to Venus? Only non-movable space probes landed on Venus, between 1972 and 1985. Only Soviet space probes landed on the surface and survived long enough (for about 1-2 hours) to transmit images and other data back to Earth. Atmosphere: very thick atmosphere (from volcanic degassing), full, thick cloud cover, and very hot because of the greenhouse effect (it is also closer to the Sun than Earth). 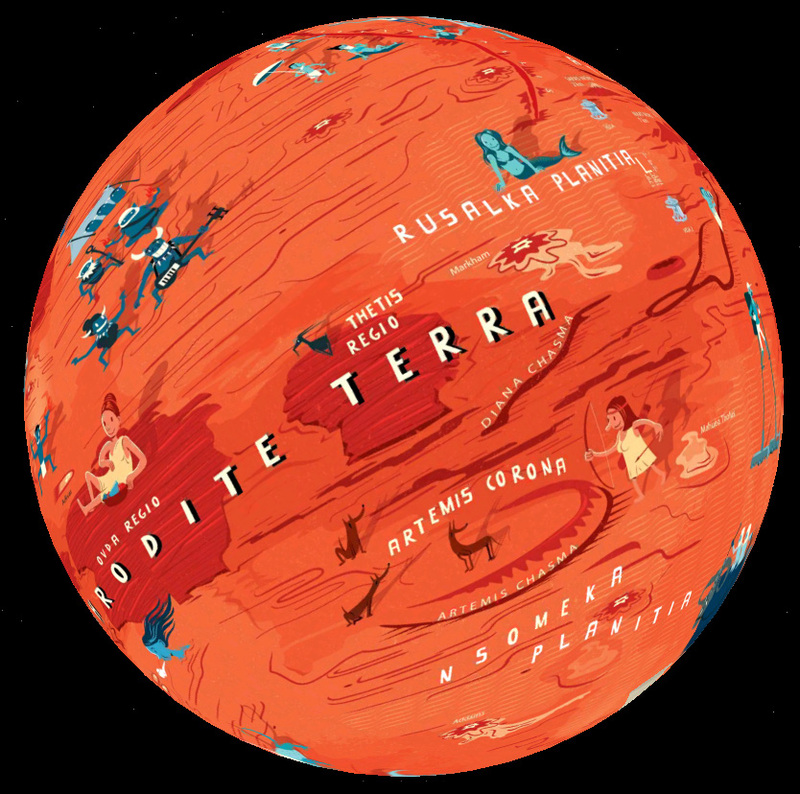 Venus map: (Illustrator: András Baranyai) The map shows a wide variety of creatures, from funny to mythological creatures. They are derived partly from the early twentieth century view of Venus of a hot jungle with dinosaurs, as well as from the current female-centered International Astronomical Union–adopted nomenclature. Some of the features that would be invisible at this scale, such as canali (lava channels), are enhanced here for clarity. Nomenclature: Names of women (first names and women scientists) and goddesses. Venus is the “planet of beauty” for its bright appearance in the night or morning sky. (Its bright clouds reflects the sunshine). The only exception is Maxwell Montes, the highest mountain that was discovered in terrestrial radar data before the naming convention was defined. Age: maximum 1 Gyr. Surfaces older than this has been covered by lava. 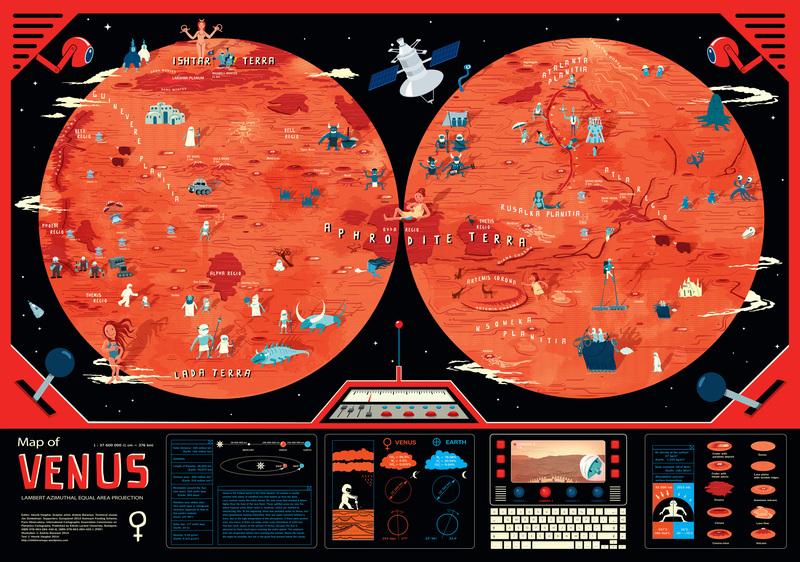 Venus map: (Illustrator: András Baranyai) The map shows a wide variety of creatures, from funny to mythological creatures. Before the space age, scientists thought that it is a hot jungle because it has clouds and it is close to the Sun, so it should be hot so it should be raining. Dinosaurs were discovered at that time and it was known that the mesosoic, when dinosaurs lived, was a hot period, so some authors fantasized that there are dinosaur like creatures on Venus. When the first spacecraft arrived to Venus, they revealed that it is very hot so all water must have been evaporated long ago and it is a very dry planet. The creature shown are derived partly from the early twentieth century view of Venus as a hot jungle with dinosaurs, as well as from the current female-centered International Astronomical Union–adopted nomenclature. Some of the features that would be invisible at this scale, such as canali (lava channels), are enhanced here for clarity. The redness reflects the hot and lava-covered surface, the only feature that is older are the higher, elevated tesserae that are remnants of the past surface. Clouds symbolize that in reality the surface can be never seen from space because the entire planet is blanketed by multiple, very thick cloud layers so even if there is a hole in one layer, two others will hide the surface. Surface topography was studied by radar.